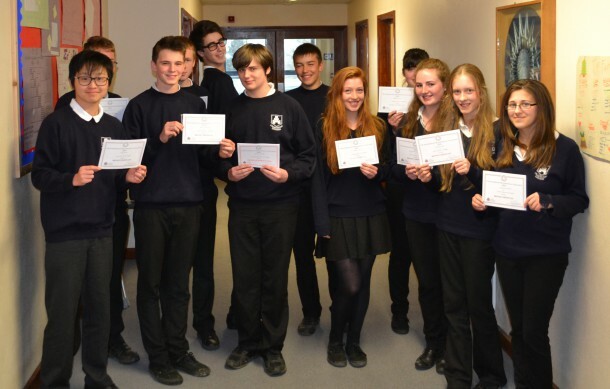 On 26th March the two teams competing in the Maths Challenge (including Callum Hudson, Joe Tibbetts, Sam Stanley and Max Whale in Launceston A and Sarah Pengelly, Emma Platt, Oliver Platt and Jessica Daw in Launceston B) traveled to Petroc College, along with Maths teachers: Mr Croxall and Miss Cliffe. The day started with an hours journey to Barnstaple where we were welcomed to the college and taken to where we were going to spend the day. As other teams started to arrive our nerves began to creep in, but as soon as we started round one of five we quickly relaxed. Round one consisted of two sheets of questions, with multiple choice answers of A>B, A<B and A=B. After this and round two (which was all about sequences) had been marked, we were not far behind any of the other four teams- we did have an advantage as we were the only school with two separate teams. Round three was the problem solving round and was also one of the hardest. Some example questions that we had to complete individually within 15 minutes are: [Include example questions, e.g calcudoku]. These questions were worth around 13 marks each, so we couldn’t afford to make mistakes. After a 15 minute break for lunch (with free biscuits and orange juice) the base 6 rounds began! Fortunately, for a few weeks previously our teams had worked on solving these types of questions. These are where six acts as 10, so numbers are sequenced like this: 1, 2, 3, 4, 5, 10. It was vital we understood this way of working to answer the questions, but even this round could not separate us as both our teams were fairly well matched. This final round was the decider- with only one mark between us. The final round was the relay round and this is how it ran: two of the four in each team had to answer question one, the other two, question two and so on until all four questions had been answered correctly. The trick behind this seemingly simple round was that all of the questions relied on each other, so the answer to question one was a vital piece of information for question two, etc. After all questions had been answered they were checked and if the first answer was wrong, we had to start all over again! This continued for three more rounds, when the results were finally announced. In 3rd place was team Launceston B and in 4th place was team Launceston A. Although we didn’t get to take home the trophy, we all felt we had learned something from it, as well as having a great time (and leaving with a free pencil and ruler)!